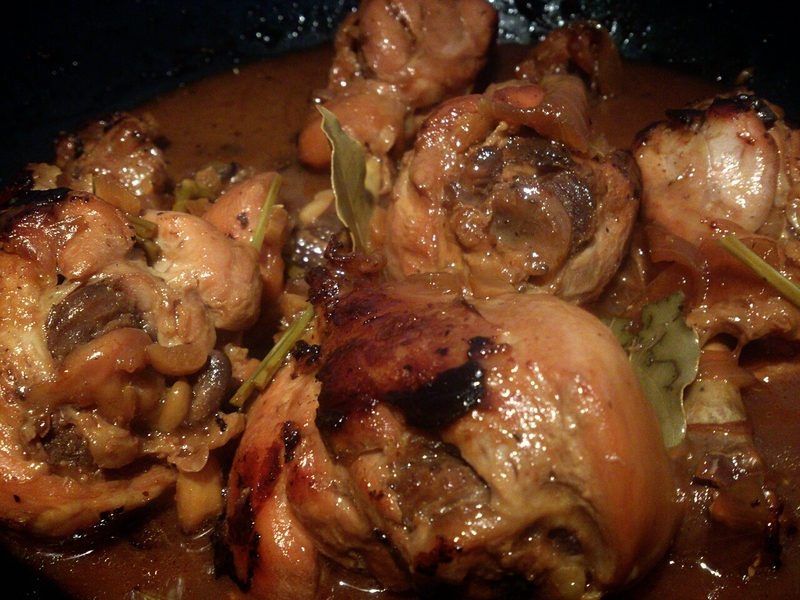 Since it’s ‘final countdown’ to the big day I’ve decided to please my husband and try adobo chicken – one of recipes his mother used to make for him. It originally comes from Philippines and it doesn’t refer only to chicken but any kind of meat, seafood, vegetable or ever fruits. There are many ways to make it, the recipe I use I got it from my friend whose family comes from there, I modified it a bit to our preferences and I must tell you… I’ve made it DELICIOUS 🙂 Maybe it doesn’t look like on those super-cooking-food blogs, but it tasted really great. Mix of salty, sour and sweet taste. 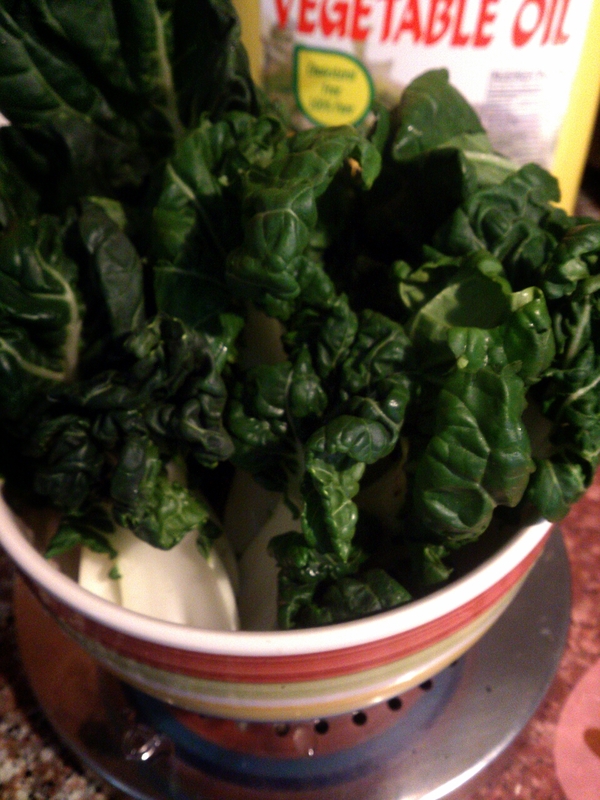 Sauce has bit heavy taste so I suggest getting some steamed veggie – I picked 小白菜 ‘baby choy sum’ also known as ‘Chinese cabbage’. 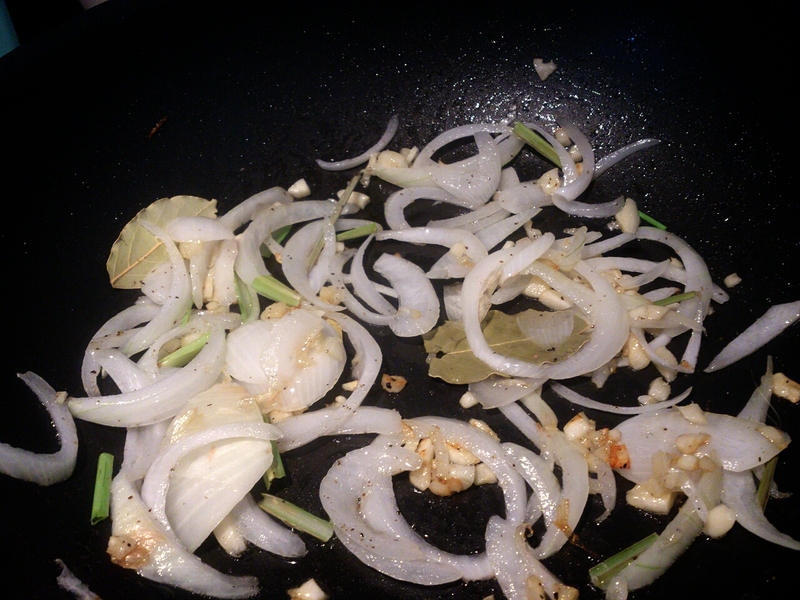 At the very beginning heat some vegetable oil on a pan, cut garlic and onion with your own preferences – I put a whole garlic and half of onion cut into rings. 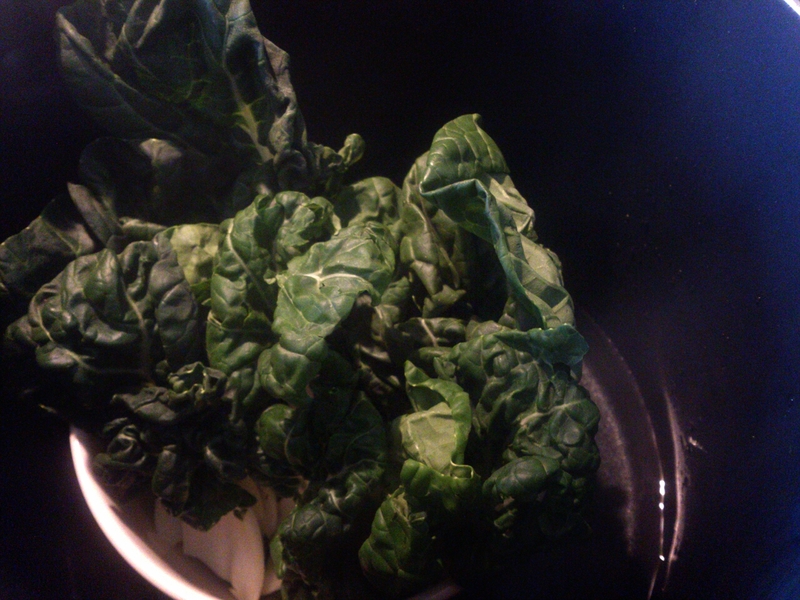 Fry them for a while, then put bay leaves, some lemon grass and pepper and keep on frying it for a moment. 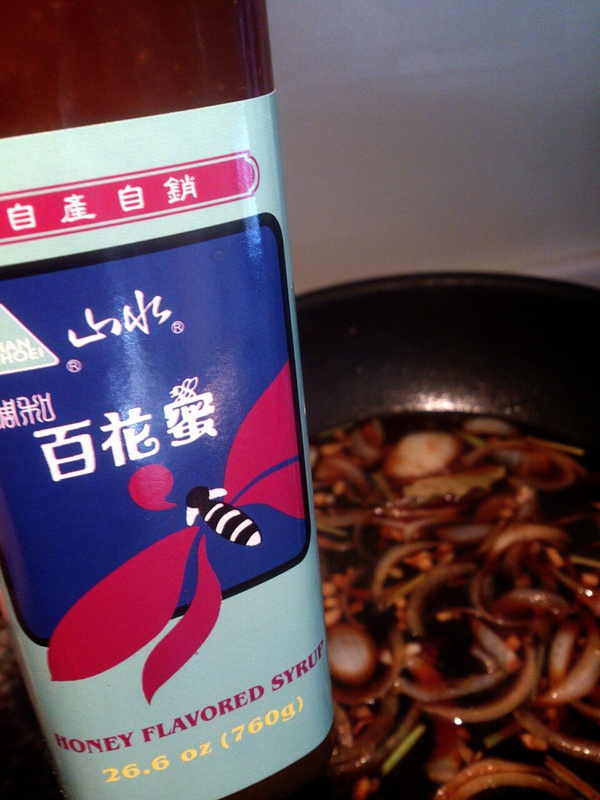 While it’s frying prepare soy sauce, vinegar and syrup (or sugar) – I put it 2:1, always more soy sauce then vinegar, you may also add a bit water if you find that mixture too salty/sour. Pour into the pan, add syrup, let it cook for a while under the lid. In meantime clean the chicken. When you’re done with cleaning just put it to the marinade and let it cook for 10 minutes. After 10 minutes flip it and let it cook for next 25-30 minutes with a small fire. 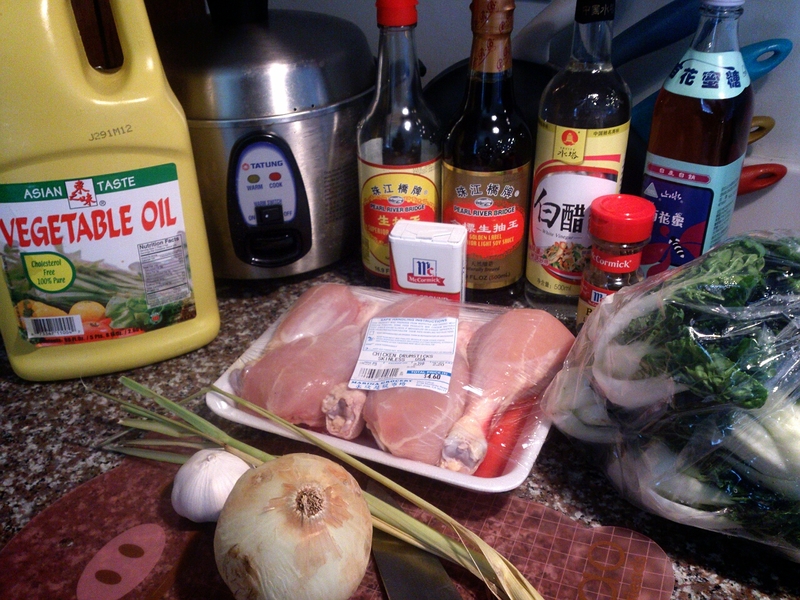 It will take a while for next step of chicken so I suggest starting preparation of the veggies. I’m only having a rice cooker which is always busy with preparing rice so I cannot use it to steam things so life and my mother in law taught how to deal with steaming – just clean your chinese cabbage with water, put it in a small bowl and put that bowl in a pot with water, make the water boil and cover the pot for around 10 minutes, but time depends on the veggie you want to steam, eggplant takes more time than leave-veggies. 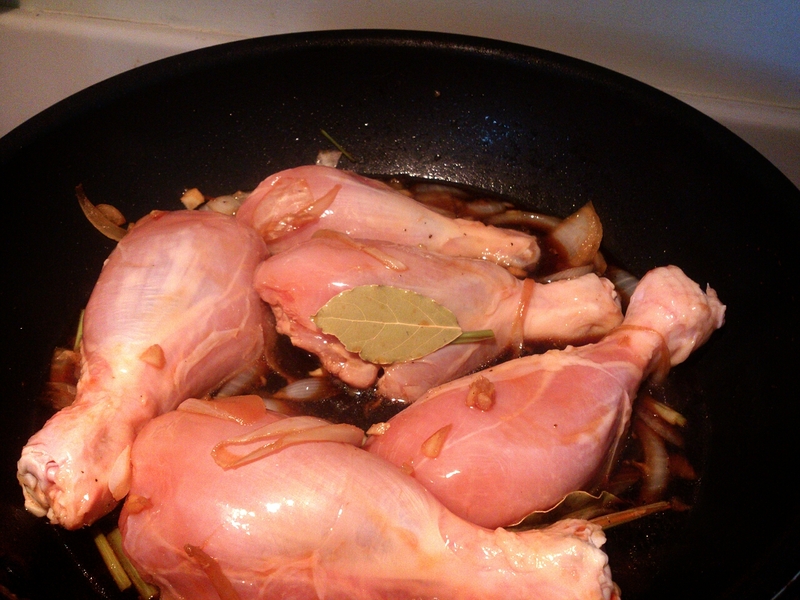 When time of the chicken comes separate meat and marinade, put oil again on pan, fry your marinaded chicken until skin gets even more brown… and put marinade again from bowl to pan and keep it on small fire, under the cover for next 10 minutes. 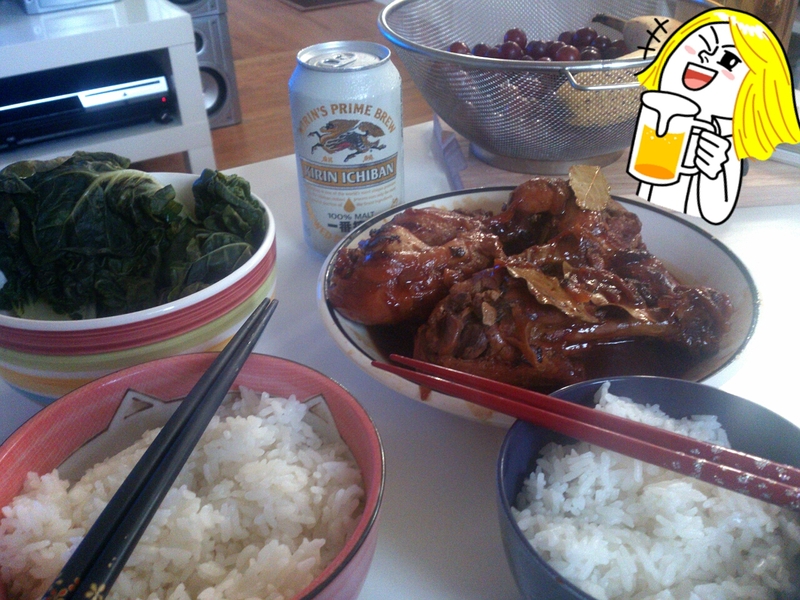 Serve your chicken with warm rice and cold beer, enjoy it’s taste. Remember – more brown your chicken gets, more tasty it will be. And after nice meal every stomach deserves to be filled with a dessert. My hubby is not a fan of chocolate or any other ‘too sweet’ dessert so it’s hard for me to pick something he might like, they still don’t make kimchi-onion icecream 😉 Anyway recently I found a thing he likes – almond flavor gelatine dessert. I call it a ‘lazy dessert’ because it’s really easy and you don’t need to do anything to make it, just follow the steps. 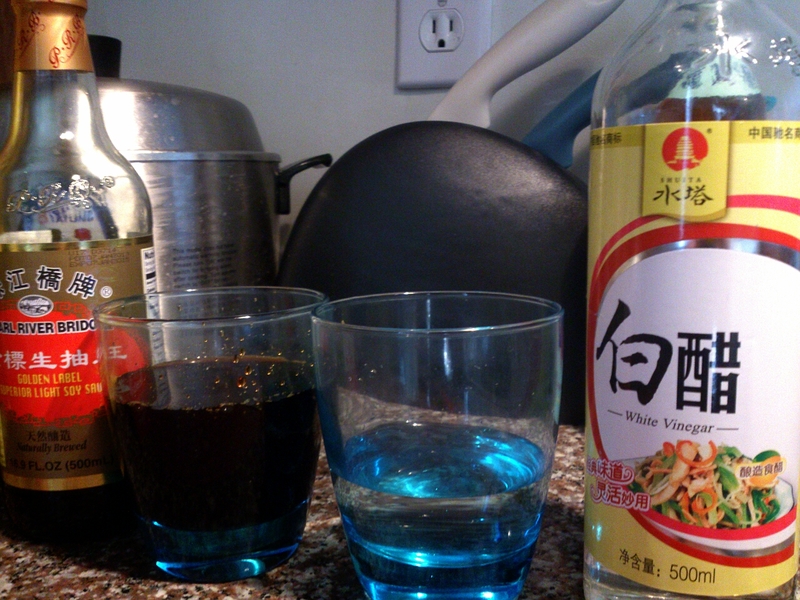 Add little bit less than 1l of water (32 oz), mix it with powder from the package. Take it away from fire, add little bit less than 0.5l of whole milk but I use ‘fat free’ one and it still works. Mix it. Put them to bowls – I needed 5 bowls in the end. 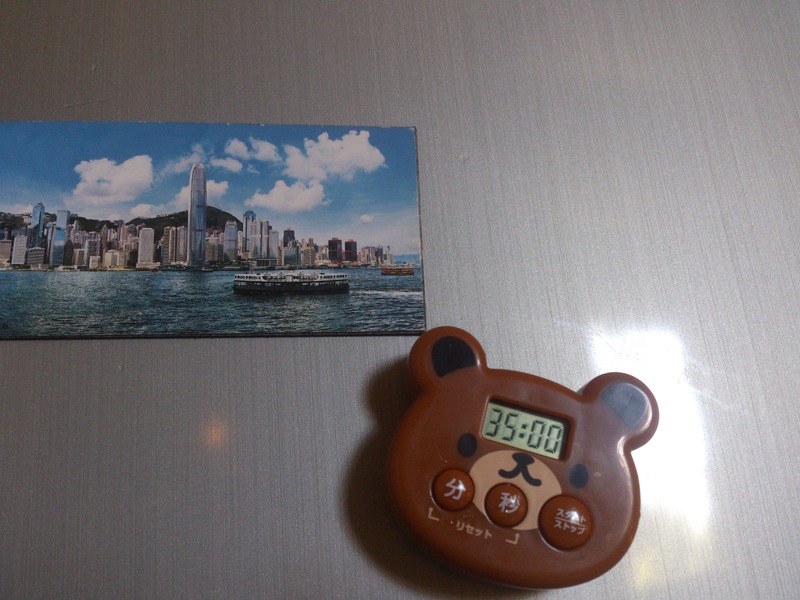 Let it cool down, then put it to the fridge for around 2h. 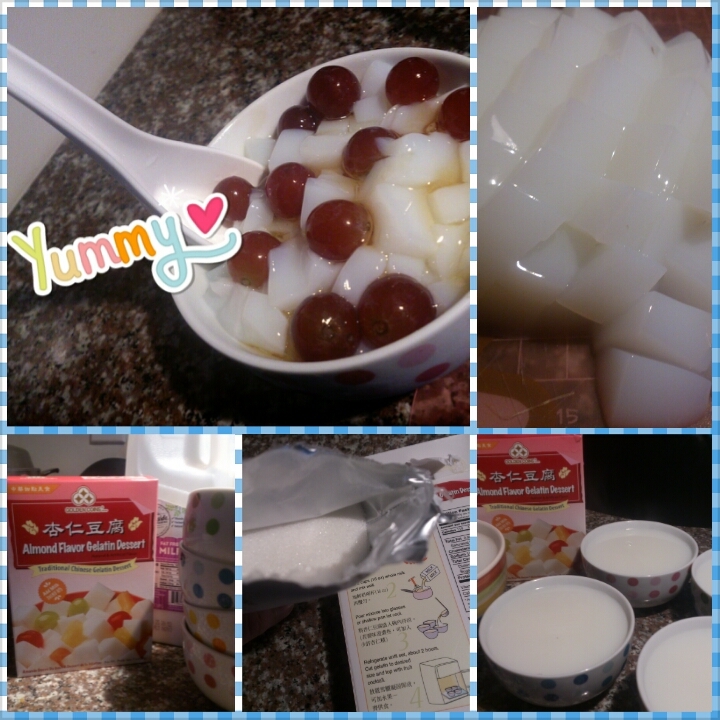 Cut into cubes, add some fruits like grapes, optionally add a bit of honey syrup. Voila. Your lazy dessert is ready to eat! At the end I would invite all of the readers to follow me on facebook for updates, more photos etc. 😄This sounds great!!! Let’s do it! Where are u originally from? Great! 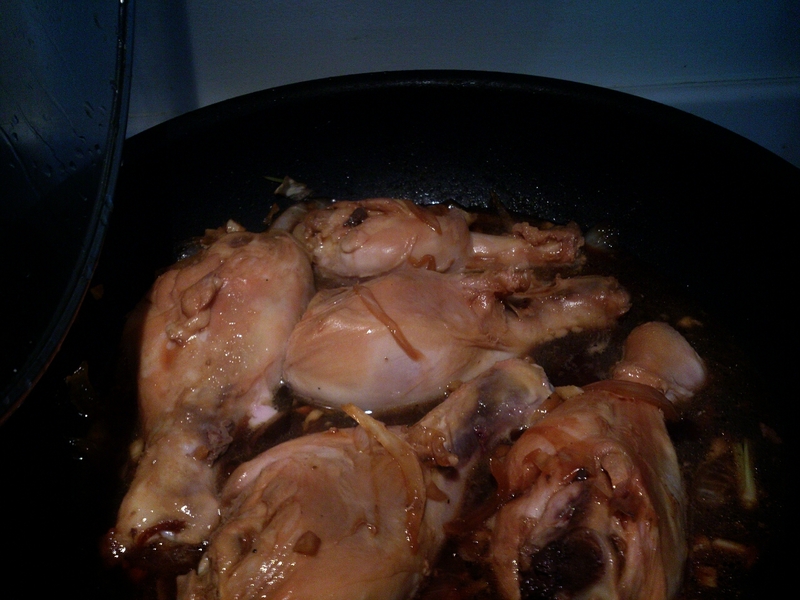 Where did you learn to cook adobo?….. You’re right, it’s a Filipino recipe. 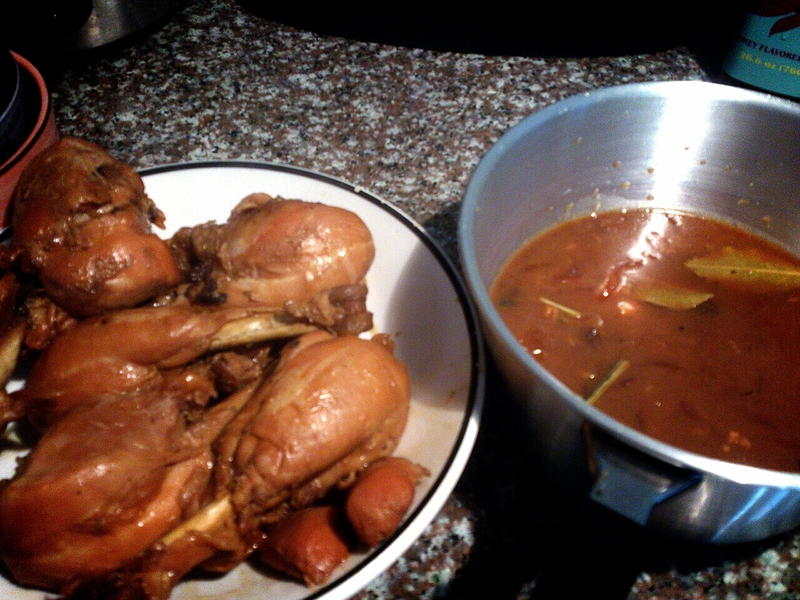 Friend of mine has Filipinos people in her family, she once prepared it for us and at the moment my husband said it’s the way his mother maid I’ve decided to ask her for recipe, modify it a bit to taste we like and make him a surprise adobo 🙂 I must say it was my first time I made it and it went out delicious 🙂 so you can try to use this recipe, for first time making it’s really easy!